Avery Peak, 4,090 feet. West Peak, 4,145. South Horn, 3,805. North Horn, 3,820 feet. 65 dF at trailhead, 75 dF at summit. Sunny skies and 80 miles visibility. Negligible breezes at summits. 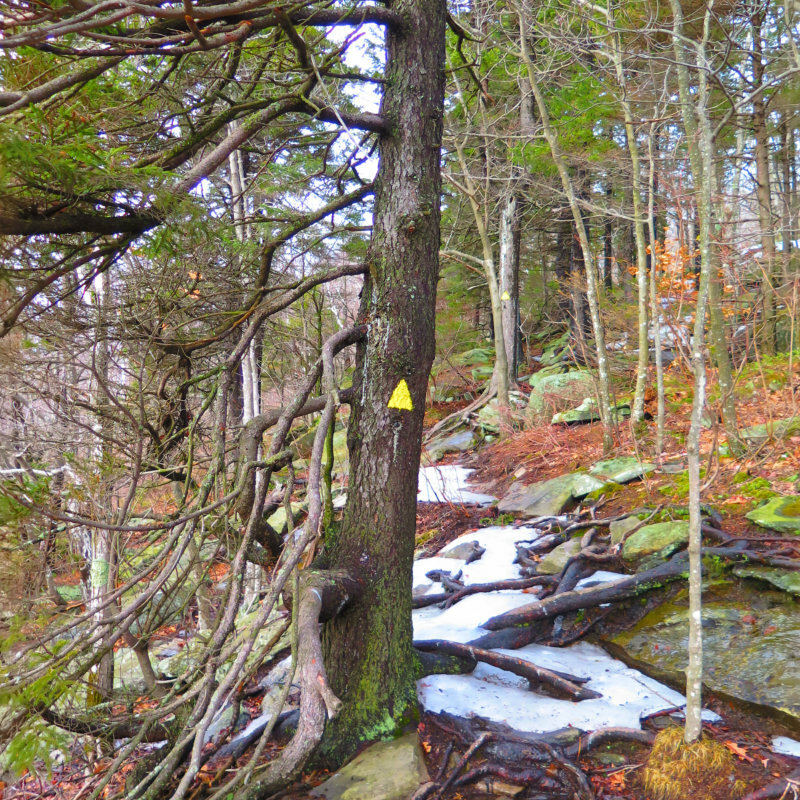 Via the Fire Warden’s trail, Appalachian trail, and Horn’s Pond trail. 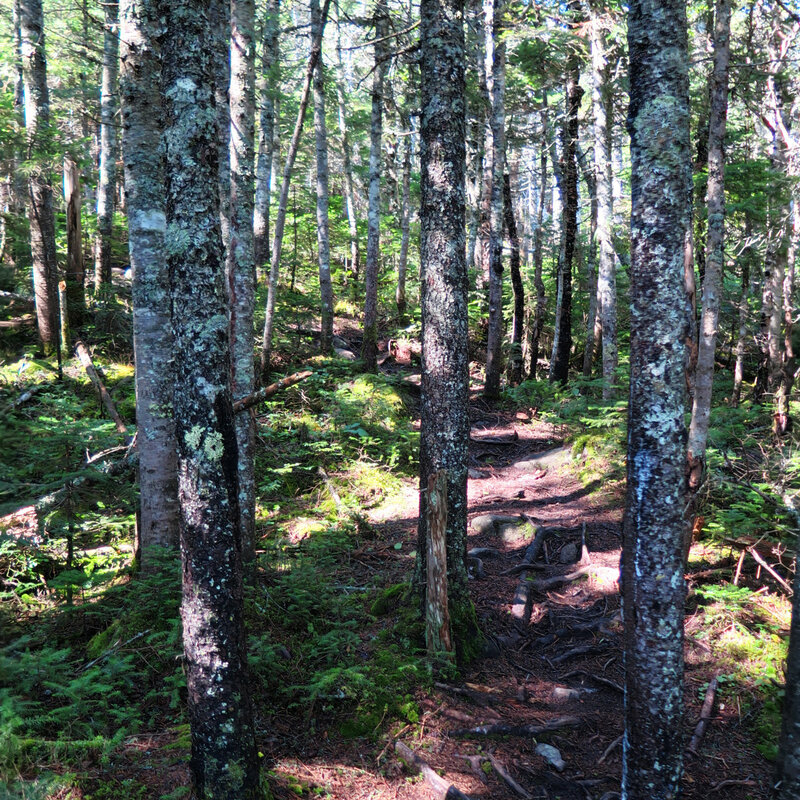 Also the North Horn spur trail. Trailhead: 0915. Col: 1200. Avery Peak: 1215. West Peak: 1300. South Horn: 1445. North Horn: 1455. Car: 1800. Approximately 13.5 miles. There is exactly one achievement the Bigelow peaks will not attain: inclusion on any “least scenic” list. I’m OK with that. I’ve tried not to play favorites with the mountains (it’s too much like asking “which is your favorite child?”) but today, that was put to the test. It didn’t help that the weather was just about perfect. Where to begin? The footbridge that passes by a lyrically beautiful pond? That the approach has tantalizing views of the peaks? The easy going nature of its trails? That it’s in the middle of some extremely beautiful land? Or shall we just skip that analysis and just focus on the day? My singular gripe is also its strength: it’s a long drive to get there. But then again, that must be its strength. If you’re up there, you’re either a. hiking the AT, or b. fanatically devoted to the cause. 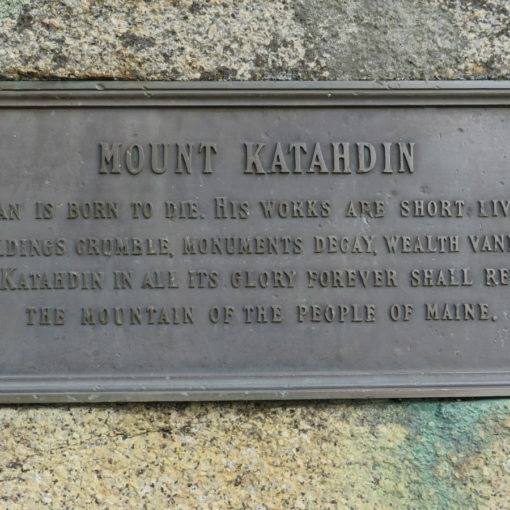 On any mountain in the Carrabassett Valley, I’ve noticed they’ve certainly not been gobsmacked by vacationing crowds. I’m OK with that. Less is more. On the topic of fanatical devotion to the cause, there was a father-daughter pair that wrapped up their 67, started 10 years ago, on Avery. I don’t even know how I’d keep track of the piece of paper with the list on it over 10 years, so that’s pretty awesome. Bonus points: she just finished college. Dad was understated, but I clearly saw he was brimming with “that’s my girl.” Go team! The trailhead is a bit away from where the trail “gets going” in earnest, but it’s a smooth, easy hike to get there. It’s hard not to make time, except for that lyrically beautiful pond that demands your attention. Take your time. It’s worth it. After you make the choice of Fire Warden v. Horn Pond, the trail starts to tip upward, and you feel like you’re getting somewhere. The forest was curious here and there: at times, I scanned the forest and saw no real understory. Weird. Water was plentiful, which is another way to say “the trail was muddy.” That being said, I never had a hard time finding water to drink. Always either a stream or a little rivulet when I’d want one, and volume was plenty good enough to get a drink. The peaks themselves weren’t was massively rocky, like Sugarloaf. The few tricky bits were brief, and relatively easy to get past. Most of the hiking was on easier grades, with very few technical sections. I can imagine that the thru-hikers appreciated this. 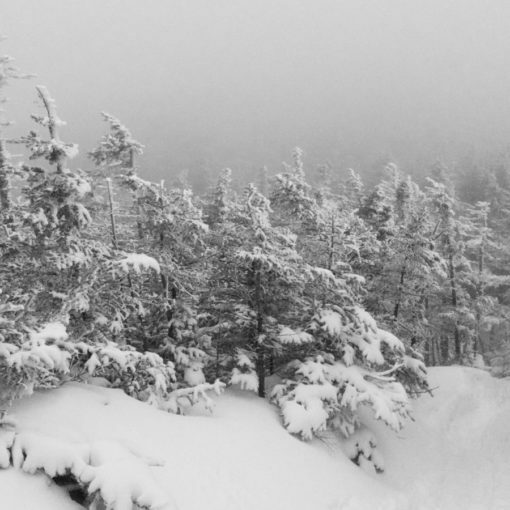 Bigelow stands with the Crockers as being the easier mountains of the Carrabassett. And this is where I make a quick side-bar. The Salomon XA 3D trail runners I’ve been wearing are awful for traction. On any given slab, I’ve been utterly paranoid that my feet will slide out from under me, at the worst possible moment. I’d had a few near-misses, until finally I went down hard (read: flat on my back, banging my elbow) this afternoon. They’re on the short list for being replaced. Stay tuned. I made decent time to the summit of West Peak, and then hopped over to Avery. There’s a neat plaque dedicated to Myron H. Avery, mentioning his collaboration with Benton McKaye, from which we get the AT itself, and that’s no mean feat. After that, it was early enough in the afternoon that I decided to bag the Horns. I just couldn’t see myself returning to the car at least 2-3 hours early. To do that was shorting this grand outing. No, that would never do. The day was already too perfect to sully. Avery and West Peaks both had superlative 360-degree views. North Peak had ones at least as good. 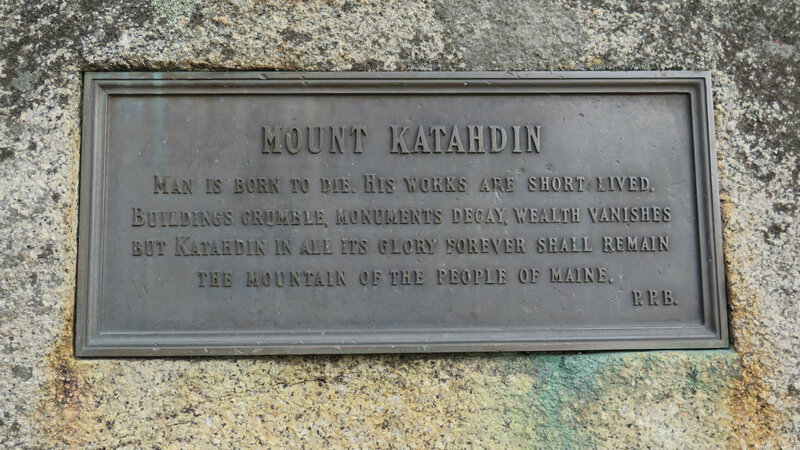 Not sure, but I think I spied Katahdin off in the distance. From the three, I saw a gigantic panorama of mountains everywhere. A glacial tarn below, which was (thankfully) just a few steps from the trail. Have I made it clear that perfection abounds here? Seriously, this needs to be on your to-do list, if it’s not already there. That tarn? Yeah, it’s steps away from the AT. Swing by. Trust me. The water’s cold and fresh, and the views are Bob Ross-serene. I was there when a fly fisherman was biding his time, just waiting for his brook trout to take the bait, and let’s just say the mountain revealed more of its magic. I left before he got his fish, but I’m positive he had dinner before I got off the mountain. Even perfect things come to an end, and so I started back for home. Turning off the AT onto Horn’s Pond trail gave me a thump. 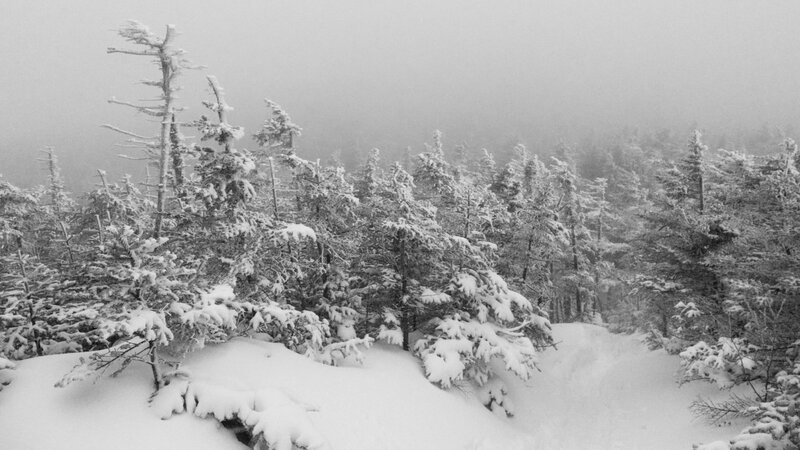 This marked the last peaks in the Carrabassett for my 67 list. I plan on coming back in the years to come, but the urgency is gone. It took quite a while to process those feelings. But then, at one point, I found myself actively laughing out loud, because the day really did turn out amazingly well. Fantastic views for fairly easy hiking, wonderful solitude… frankly, the whole lot came very close to perfection, demanding a return. Oh yes, I will be back. These mountains have too much perfection to ignore. Logistics: On route 27 west in Kingfield, drive about 3 1/2 miles past Sugarloaf ski area. Just past the town line of Wyman, turn right onto Stratton Brook Pond road, which is a small dirt road that goes past a few houses. Keep going for about a mile, and you’ll see the trail head signboard and a small parking area. You’ll want to take the path to the left of the signboard. Pictures will be in a separate post.